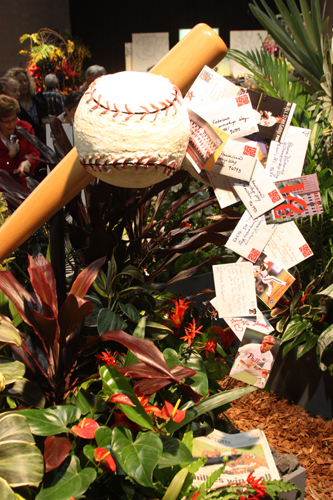 The display, entitled “The Phillies’ Flyin’ Hawaiian”, won an award for outstanding blue ribbon winner in the mailbox classes for the Garden Club of Philadelphia. It also got me even more impatient for the start of Games That Matter. Spring training games are great if you’re there in person, but watching them on TV just doesn’t cut it for me. Bring on the season! I know what you mean about watching Spring Training games on TV or hearing it on Radio, unless is Vin Scully then all bets are off or Jaime Jarrin or Pepe Yniguez. But I rather be there in person. 23 Days for us before Opening Day in San Diego. 28 Days before Opening Day at Dodger Stadium. Ha, that’s clever. The only thing I don’t get is why Victorino gets SO much publicity for being Hawaiian. I guess there aren’t many players from there, but there also aren’t many players from a bunch of other states. I don’t know, I just think it underplays how good of a Baseball player he is and not some “side-show” attraction (from a national perspective, anyway). There’s only days left until the 2012 season starts. I can’t wait!!! Watching that first ST game or two on TV is great, like food for a starving person to me. But after that, I realize that the food in question is like nasty McDonald’s or something and I start jonesing even harder for the regular season.